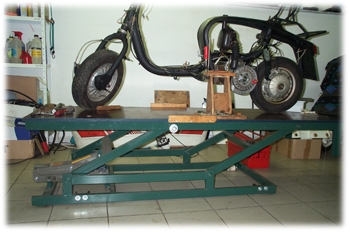 When working a lot on scooters or motors, a comfortable working position is of invaluable comfort. 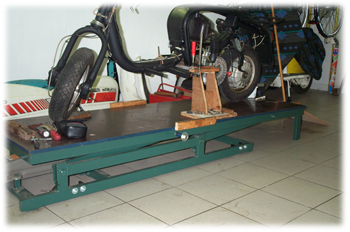 As it is impossible for one person to install the scooter on a bench for some service, that means either working on the floor or investing in a motor-lift. 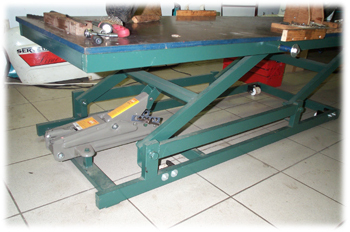 When you have welding capabilities you may consider a DIY project as in the photos underneath. 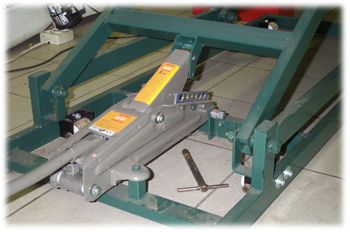 This one is bases on a universal hydraulic carjack (that seems to be leaking some oil after 2 years of use now, but was easily repared with a new o-ring).